Three West Coast Eagles premiership stars have locked away contract extensions. Experienced midfielder Mark Hutchings has automatically triggered an extension into the 2019 season by virtue of his outstanding form in 2018, while young defenders Tom Barrass and Tom Cole have agreed to terms to continue for at least the next four years. 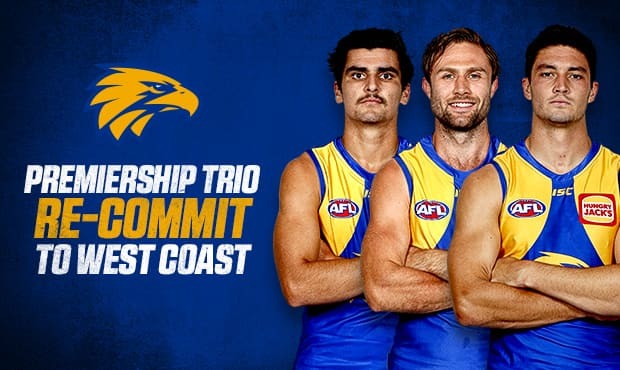 Barrass and Cole were each committed for the 2019 season, but they will now remain with the Eagles until at least the end of the 2022 season. Eagles List Manager Brady Rawlings said he was delighted to have those three key players re-committed to the club. “Tom Barrass and Tom Cole are both exciting young talents who were important to our success in 2018, so it’s very pleasing to have them commit to the club at this early stage until the end of the 2022 season,” Rawlings said. Cole, who earned a rising star nomination following his round 19 performance against North Melbourne, played 21 of 25 matches in 2018 while Barrass played 19 games, missing four senior games because of a mid-season back injury. Both were key elements of the Eagles’ revered back seven, with Barrass outstanding in the Grand Final, particularly in the first half, against towering Collingwood American import Mason Cox. So good was Hutchings’ form through the season that he finished seventh in the Club Champion Award despite missing five games. After being on the fringe of the team until round 13, he played the last 13 games and in the Grand Final nullified key Pies play-maker Steele Sidebottom in a performance that was central to the team’s gripping five-point victory.